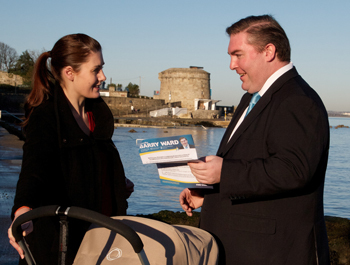 My name is Barry Ward and I have represented Blackrock, Booterstown, Deansgrange, Monkstown and Stillorgan as a Fine Gael councillor since 2009, when I was elected on for the first time. It may be a cliché, but I have been deeply proud to represent Blackrock and have thoroughly enjoyed the progress we have made on the Council since I have been a part of it. I have been an active and passionate advocate for people and businesses in the Blackrock area and throughout Dún Laoghaire-Rathdown. Since being elected to the Council, I have worked with residents, traders, council officials and outside agencies to broker solutions that work for Blackrock and the surrounding areas. A graduate of UCD (and recently elected to UCD’s Governing Authority), I have used my expertise as a lawyer and my local knowledge to put together innovative solutions for our area, presenting several sets of draft bye-laws to the Council and working as a proven, considered and constructive contributor at Council meetings. I am proud that commercial rates have never increased since I was first elected in 2009, and have been reduced four out of six years since I became a councillor; I place a strong emphasis on the Council’s role in supporting the local economy. I am extremely grateful to the residents of the Blackrock area for re-electing me in 2014. I took the third seat out of six and received a strong mandate to continue to work hard for you. I am delighted that my colleagues on DLRCoCo and Dublin City Council have taken up my idea to establish a Joint Committee between the two Councils to progress the Sutton to Sandycove coastal promenade and cycleway (S2S), and elected me to one of the seats on it. This is a really important project that will provide a fantastic public amenity, tourist attraction, transport corridor, health facility and easy access to Dublin Bay, and I have been the leading voice in Dún Laoghaire-Rathdown in making sure that it happens. I have known Barry for many years and I know him to be a person with fresh ideas and the conviction to deliver on them. I know he will make a great councillor. Barry Ward was a very effective member of my team. I know he will get things done for you.